We visited the city of Turku in west Finland yesterday with the OH-PRT Piper Lance aircraft flown by Ilkka Koho from MIK. The weather was perfect for aviation, and the snowy Finnish countryside looked beautiful. Tigert has more good pictures. Thanks to Ilkka and Tuomas for inviting us! On saturday we flew to the Nummijärvi Fly-In meeting with the Alpha-Yankee C172. Very interesting event arranged on a airport built on lake ice, I even got on a short spin in a Morane Rally. Tigert has again a bunch of pictures. This is my first blog post using the new Midgard support for the Markdown syntax. Really nice and productive! It is even possible to configure MarsEdit to use Markdown for previews. 02 August 2005. 1 minute read. I had another solo travel flight last weekend, this time with Cessna 152 OH-CWM on route Helsinki - Hanko - Turku - Helsinki. 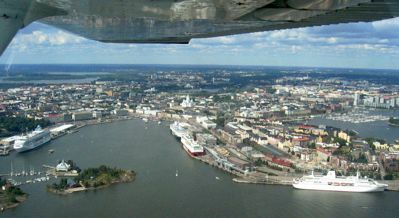 Especially the flight over the Turku archipelago was really nice.